Too many crossings out, time for a rewrite! I would also like to inform you that we will be releasing Synergy and future updates through Steam! 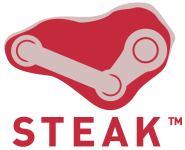 Valve Software has allowed us to do so by giving us access to the Steamworks SDK. We are honored to be one of the four (sic) first selected mods to be given this opportunity. We will certainly put this to good use! This plugs the final gap in Steam’s handling and presentation of mods; now they are to all intents and purposes they are free games, including, apparently, support for sub-mods. Previously mod teams had been told they were too small for Valve to support, and before that that their work was one day going to be distributed over Steam’s Peer-to-Peer network. Although Steamworks doesn’t by itself give a game a presence in the Steam store, the more popular mods are already listed and are unlikely to be removed just to comply with Valve’s rules for commercial games. And Synergy, of course. There’s no known date for when Valve will start extending offers to other mods, and knowing Valve most likely isn’t one at all! Ohh, good news. Hopefully this will further increase a mod’s playerbase or otherwise revitalise it. I’m especially pleased about Adam of MINERVA fame getting a job at Valve. I’m sure we’ll see some of his grand influence in the maps in Episode 3. I bet 10$ that ZPS! will be there too. This is really good (and kind of unexpected) news. Where did you see DIPRIP? I can’t find it in my cache. Edit: never mind, I found it in the blob.